An athletic, contoured exterior exudes confidence. Inside, chrome and woodgrain accents provide a premium setting to experience the road. And with seating for give adults, everyone's invited. The Internet's along for the ride with available built-in 4G LTE Wi-Fi®†. And with the standard 8-inch diagonal Chevrolet MyLink† touch-screen display, you can send and receive texts, play music and more. Impala offers support for Apple CarPlay,† a smarter way to use your iPhone® to access your iMessages, music, select apps and more. If Android is more your style, available Android Auto™† compatibility lets you connect your compatible smartphone to access your calendar, playlists and select apps such as Google Maps. Stay seamlessly connected with available built-in 4G LTE Wi-Fi.® Connect up to seven devices to easily access apps, stream music or work on the go, on a signal that's even more powerful than your smartphone. The myChevrolet App puts the power of Chevrolet in the palm of your hand, letting you stay connected to you vehicle from virtually anywhere. Available advanced safety technologies can help give you added driving confidence from the front, back and sides. In addition to these advanced features, the 2018 Impala received a 5-Star Overall Vehicle Score for safety from NHTSA† . Safety features are no substitute for the driver’s responsibility to operate the vehicle in a safe manner. The driver should remain attentive to traffic, surroundings and road conditions at all times. Read the Impala Owner’s Manual for more important safety information. 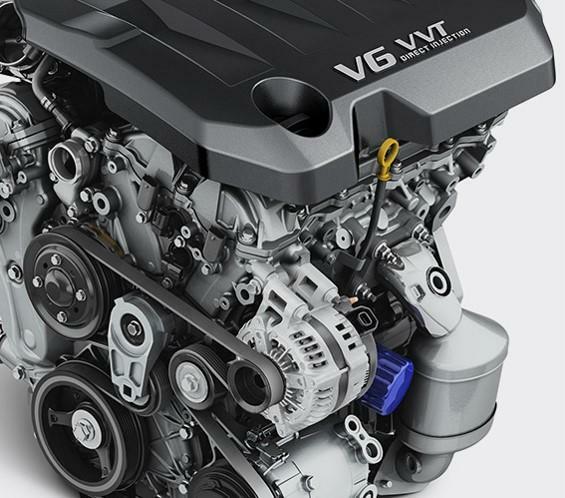 Efficiency and performance come standard, whichever engine you choose. And with technologies like Direct Injection and stop/start technology, you'll want to take the long way in Impala. † Government 5-Star Safety Ratings are part of the National Highway Traffic Safety Administration’s (NHTSA’s) New Car Assessment Program (www.SaferCar.gov). † With available 3.6L V6 engine. † Vehicle user interface is a product of Apple and its terms and privacy statements apply. Requires compatible iPhone and data plan rates apply. Apple CarPlay and iPhone are trademarks of Apple Inc., registered in the U.S. and other countries. † Vehicle user interface is a product of Google and its terms and privacy statements apply. Requires compatible smartphone and data plan rates apply. Android is a trademark of Google, Inc.
† Visit onstar.com for coverage map, details and system limitations. † OnStar acts as a link to existing emergency service providers. Not all vehicles may transmit all crash data.